Brown spots on lawns can be the result of dry grass, pet damage, diseases, and many other causes but Insects might also be the culprits. There are really only 2 insects that feed on and damage lawns in Manitoba, Chinch bugs and Sodwebworm. 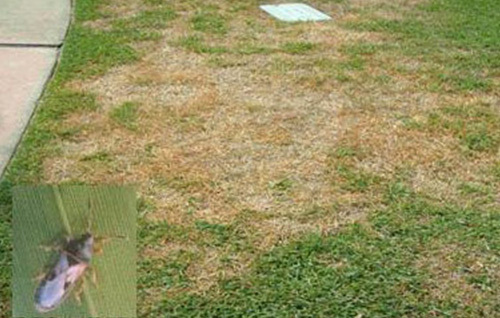 Chinch bugs are perhaps the most devastating of all turf insects. High population levels can kill extensive areas of turf in only a few days! Damage is caused when chinch bugs insert a slender beak into grass plants along with a toxin to extract plant juices. The combination of the toxin and the extraction of vital plant juices kill or debilitate the grass plant. Chinch bugs are very prolific – females can lay 15-20 eggs per day! Eggs hatch into yellow wingless nymphs and then turn brick-red with a white band across the body. Adults are a brownish black colour and are less than 1/4″ long. First symptoms are patches of dead grass in sunny areas often near trees or flowerbeds. Bugs are active when temperatures are above 22C. Damage usually begins around Mid June. Bugs can be seen scurrying around warm sunny areas. They avoid shaded areas. Sod Webworms are the larval stage of a small dingy brown moth with an open wingspread of about 3/4″. The eggs hatch in mid August to produce larvae that start feeding immediately. Webworms are active only at night – chewing on grass blades, severing the entire plant at the crown and feeding on roots. During the day they tend to retreat to silkened tunnels in thatch or just below the soil surface. Webworms pupate in fall just below the soil surface in a loose cocoon and emerge the next summer as a moth. Damage appears as irregular brown patches similar to chinch bugs but not restricted to sunny areas. Look for the presence of “frass” (worm droppings). Grass in the damaged area pulls up easily by hand revealing a white worm with a copper coloured head. Damage usually occurs in late summer or early fall.